The Reform Movement, under the sage guidance of Rabbi David Saperstein, has always taken the lead in domestic politics. Saperstein, voted Newsweek Magazine's most influential rabbi, heads the Reform Movement's Religion Action Committee (RAC). The RAC's website states that it "has been the hub of Jewish social justice and legislative activity in the nation’s capital for more than 40 years. The RAC educates and mobilizes the American Jewish community on legislative and social concerns, advocating on issues from economic justice to civil rights to religious liberty to Israel." Similarly, the Orthodox Union has the OU Institute for Public Affairs. The Conservative Movement has never had a Washington Office or a "man in D.C." Until now. Recently, the Rabbinical Assembly tapped Rabbi Jack Moline (right) to be its first director of public policy. 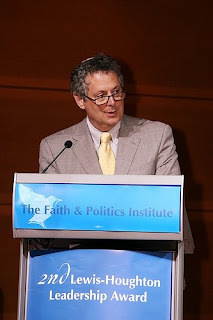 Moline says the position will be an extension of the political advocacy and activist work he's been doing as an individual rabbi for the last 25 years, and he's anxious to use the connections cultivated in Washington to advance the agenda of Conservative rabbis. The goal is to bring as much added value to public policy discussions as possible, especially by the inclusion of perspectives that reflect the Jewish values that flow from the ethos of Conservative Judaism. Of necessity, I will rely on colleagues from the OU and the RAC, JCPA and UJC, but our advocacy will not be an automatic echo of either one. Effective advocacy is a matter of finding common ground – in a sense, p’sharah – not merely proclaiming ideals. As such, we will sometimes find ourselves in coalition with groups with whom we will other times disagree: Roman Catholics, Evangelical Christians, Muslims, atheists and a host of Protestant denominational groups. Already, one notices the Rabbinical Assembly finding its voice when it comes to matters in Washington. 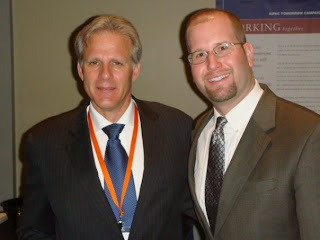 Only days before the AIPAC Policy Conference, it was announced that Michael Oren was being considered for the position of Israeli Ambassador to the United States. The Rabbinical Assembly wasted no time in issuing a press release to commend the appointment. The RA noted in its statement that Oren is the product of a Conservative Jewish upbringing in New Jersey. Further, Dr. Oren spoke at the RA convention in 2004, following the publication of his book, Six Days of War. Rabbi Julie Schonfeld, the incoming executive vice president of the RA terms Michael Oren an "iconic figure whose intellect and communication abilities are without peer in contemporary political life. No one today can argue the case for Israel in quite the way that he can," she reiterated. "Whether in his IDF uniform in front of CNN’s cameras or on the pages of the Wall Street Journal or the New York Times, Michael Oren has been acting as a de facto ambassador for Israel for quite some time." At the AIPAC conference, Dr. Oren spoke at a luncheon for rabbis. The RA also noted in the press release that "the overwhelming majority of rabbis who were in attendance [at the luncheon] are Conservative." To be fair, Oren explained that his Judaism has roots in many movements. In fact, he explained that he was raised in Conservative Judaism but dropped out of his Conservative synagogue's Hebrew School. He's also had religoius experiences with Chabad and was a member in the Reform "Kol Haneshama" in his Jerusalem neighborhood. Oren is a great choice for the ambassador position. I've heard him speak several times and I've been impressed on each occasion. He will certainly have company in Washington with other political and economic leaders who have roots in Conservative Judaism, including Chairman of the Federal Reserve Ben Bernanke and Chief of Staff Rahm Emanuel. Kudos to the Rabbinical Assembly for acting on the need for representation in Washington. The Reconstructionist Rabbinical Association would do well to take note!